Bain Circuit Court Clerk Greer Galloway had never worked with another judge. But all that changes when Special Judge Reed Shelton gets appointed to handle a local notorious criminal case. Delaney Carlisle, the newly-appointed prosecutor, and Rex Roberts, defense counsel constantly argue. And Judge Shelton and Rex seem to hate each other and do little to hide it. Then bad things come in threes, as the old superstition goes. The A/C goes down in the middle of a heat wave, Greer learns her ex is dating Delaney, and a problem juror, Tobias Madden, goes missing. Soon a body washes up at a bridge where two jury views of the crime scene took place. And with plenty of enemies—an ex-wife, a former business partner, and even his own mother—Tobias’s death becomes a murder investigation. When another body turns up, Greer fears that both deaths are connected to the murder case. But she has little to go on but instinct. And that may not be enough to keep her alive long enough to discover the killer. 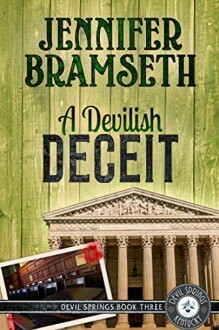 A Devilish Deceit is the third book in the Devil Springs Cozy Mysteries Series. Coming in winter 2019.